Pre-owned in excellent condition and beautifully looked after, this piccolo is fully maintained and plays great with no leaks or issues. Pads are in excellent condition, the keywork has some very light tarnishing mainly on the keyposts, but the keywork is very responsive. Probably the most popular student piccolo in the world. The Yamaha piccolo plays well, tuning is accurate and the keywork reliable. Because the headjoint has a lip-plate similar to a flute, it feels familiar to flute players, making it easy to play. 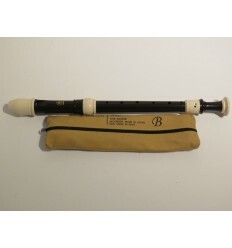 This piccolo is very popular with students as well as doublers due to its easy playability, accurate intonation, and characteristic piccolo sound. The body is made of sturdy, maintenance-free ABS resin for a sound similar to that of natural wood. The durability of these instruments makes them ideal for beginners, while their accurate intonation helps students develop a good ear.